The natural world is such a wonderful and mysterious thing; we’re always continuously gaining new information about things we might have previously thought we knew everything about. Although many natural ingredients have been used since ancient times by our ancestors’ ancestors, it seems that we have lost much of the information regarding those purposes today. As time passes and more attention is given to natural ingredients and their many benefits, we will continue to learn more about things that used to seem to be ordinary ingredients. In fact, the most ordinary fruit or vegetable might even have insanely beneficial purposes when used in other forms. What Is Black Raspberry Seed Oil? You probably know what a raspberry is, whether it be black or red; it’s a popular fruit that many people love to enjoy whenever it’s in season. While it is certainly quite a delicious fruit, raspberries can also be used to create a very beneficial oil that can be used for both skin and hair treatments. The oil derived from the black raspberry, scientifically or botanically named Rubus Occidentalis, is made from the seeds of the fruit using a cold-press method, which guarantees that the oil will have a stronger aroma and more highly concentrated nutrients than oils that have been processed using heat. The black raspberry plant, unlike many plants that are used to produce oils, is actually native to the United States and Pacific regions. Black raspberry seed oil has one of the highest concentrations of antioxidants and essential fatty acids. It contains about 85% essential fatty acids, of which 30% are Omega-3s. The oil is also rich in Vitamin E, containing four different types that include beta tocotrienols, gamma tocotrienols, alpha-tocopherol, and gamma-tocopherol. It is also very high in anthocyanins and linoleic acid as well as several Omega-3 and Omega-6 essential fatty acids. Other essential fatty acids found in black raspberry oil include stearic acid and palmitic acid. The differences between the two are not very significant. They both provide the same benefits although, you might need to use higher quantities of one compared to the other to achieve the same results. Thanks to the many essential nutrients that can be found in the makeup of black raspberry seed oil, adding this oil to your skin or hair care regimen could be very beneficial. Black raspberry seed oil is rich in Vitamin E as it has four different types, beta tocotrienols, gamma tocotrienols, alpha-tocopherol, and gamma-tocopherol. The combination of these tocotrienols and tocopherols means that the oil has very powerful antioxidant properties that can help combat free radicals and repair damaged skin. On top of that, Vitamin E is also a great source of sun protection and it can also help heal your skin of any wrinkles or fine lines that may have been caused by too much sun exposure. While the oil shouldn’t be used as a replacement for sunscreen, it can be a great addition when applied underneath. Black raspberry seed oil is made up significantly of several different essential fatty acids including Omega-3s, Omega-6s, stearic acid, and palmitic acid. Alpha-linoleic acid is an essential Omega-3, linoleic acid is an Omega-6, and oleic acid is an added Omega-9. Because of how well-rounded the selection of essential fatty acids is, black raspberry seed oil reaps many benefits. These fatty acids are great for sun protection, hydration, healing wounds, reducing inflammation, and regeneration. The benefits of healthy nutrients found in black raspberry oil don’t stop there, though. Overall, this oil can help in many purposes, thanks to its many beneficial components. This oil reduces the effects of oxidation, which therefore can help promote anti-aging and the reduction of wrinkles and fine lines. Ellagic acid fights the reduction of collagen in your skin, which helps reduce and prevent wrinkles and other signs of aging. Other antioxidants found in black raspberry seed oil are also responsible for promoting boosts of collagen and fighting free radicals to promote healthier, younger-looking skin. If you have inflamed or acne-prone skin, black raspberry seed oil could be a great method of treatment. The many sources of Vitamin E and essential fatty acids that can be found in black raspberry seed oil help improve the elasticity and hydration of your skin. While it might seem strange to fight oily skin by applying more oil, the differences in the oil actually work together to help balance your skin and leave it looking healthier and fresher. It may be surprising but the use of black raspberry seed oil could also help promote ketogenic weight loss. The healthy fats found in this great oil could actually help break down unhealthy fats more quickly and improve your body’s metabolism. 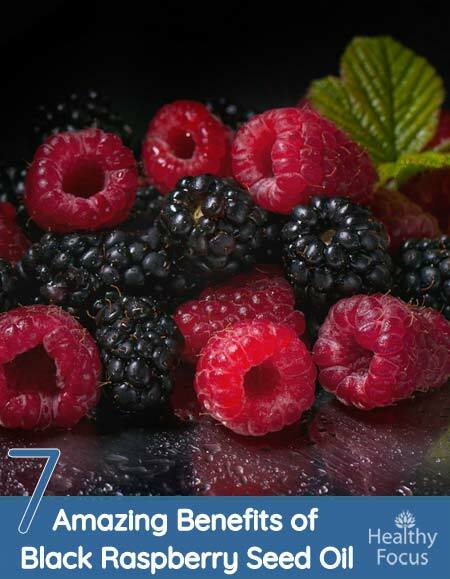 While there is still much more research to be done in this area, adding black raspberry seed oil to your diet could significantly increase the results you see on your weight loss journey. What is Black Raspberry Oil Good For? Black raspberry oil is a rich source of antioxidants that can help protect the skin from the damaging effects of free radicals. When applied topically, it may even help reverse the damage done to the skin’s cells and protect against common signs of aging like wrinkles and other blemishes. Black raspberry oil contains a compound called ellagic acid which is a natural antioxidant found in a number of fruits and vegetables. 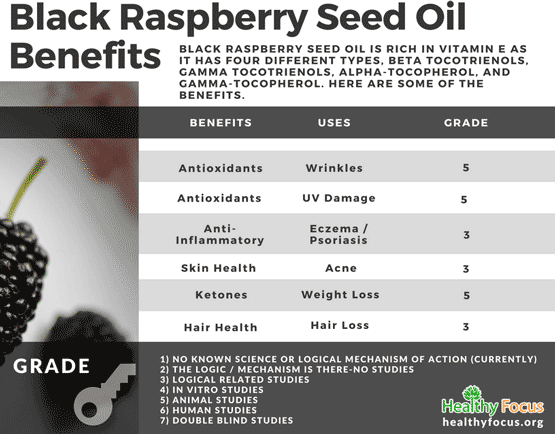 Ellagic acid and the other antioxidants found in black raspberry seed oil can have a very positive effect on your skin’s health and appearance. Black raspberry seed oil also contains a number of anti-inflammatory compounds which may help treat certain chronic inflammatory skin conditions. If you suffer from one of the many common inflammatory skin complaints like eczema, psoriasis and rosacea, applying black raspberry oil may well help. It can soothe irritation while reducing swelling and redness on the skin. Acne is a very common condition but it can be a very embarrassing problem especially for teenagers and young people that are more prone to developing the condition. Acne is caused by the build up of excess sebum as well as dead skin cells that block the skins pores. While the correct balance of sebum can help maintain healthy skin, an excess of the substance acts as a source of food for the bacteria that leads to acne. As a result, you are left with unsightly pimples, blackheads and acne which can then lead to unsightly acne scars. Black raspberry seed oil is a great natural treatment for cleansing the skin and keeping the pores open in order to clean out excess sebum. As we have already mentioned, black raspberry oil is a rich source of ellagic acid – a powerful antioxidant that can protect the skin from free radical damage. According to research, the oil may help protect you from the damaging effects of sun exposure. Black raspberry oil also works as a wonderful, natural moisturizer for your skin. When you apply the oil topically, it helps preserve the moisture in your skin and forms a protective barrier to prevent moisture loss. Applying this oil to your skin will keep it feeling healthy, supple and hydrated. It is a wonderful remedy for people with dry skin that are looking for a natural treatment. As well as being applied topically to the skin, studies have revealed that consuming black raspberry seed oil could promote weight loss. Although the study was done on animals, the same benefits may apply in humans. Instead of burning carbohydrates for energy, the body will burn its fat reserves instead. This is the mechanism that has made low carb diets like Atkins so popular and effective. Black raspberry seed oil is not only good for the skin but it can also help nourish your hair. It contains folic acid which is essential for your hair’s health while a deficiency in the vitamin has been linked to hair loss. Try applying a little black raspberry seed oil to your hair and combing it in evenly as a conditioning treatment. We think you will be very pleased with the results. Comedogenic ratings exist to help people determine which oils or other skincare substances might be appropriate for their skin types, especially if the person has oily or sensitive skin. A given comedogenic rating will range from a scale of zero to five and the lower numbers show that the oil is likely safe for use by people with sensitive or oily skin. Substances with low comedogenic ratings, also known as non-comedogenic substances, shouldn’t irritate your skin, clog your pores, or make skin conditions such as acne become worse. Because of the high concentration of linoleic acid found in black raspberry seed oil, the oil has been given a very low comedogenic rating of one or two. The oil contains approximately 48% linoleic acid and only 10% to 18% oleic acid, which makes it great for people with dry skin or skin that is often prone to acne or other similar skin conditions. Oils that have higher concentrations of oleic acid would be higher on the comedogenic rating scale. With that said, comedogenic ratings are simply meant to act as general guidance when choosing what oils should be added to your skincare routines. Everybody’s skin is different so you should speak with your doctor or test out a small amount on a small area of skin to see how you will react to the oil as you may still have a poor reaction to a lower-rated oil just as you might not have a poor reaction to one that has been highly rated. How Can You Use Black Raspberry Seed Oil? Black raspberry seed oil has many uses, thanks to the many incredible benefits that it provides. When used in products sold in the beauty and skincare industry, it is often used in anti-aging treatments, sun protectants, daytime creams or serums, and treatments for dry or damaged skin. You can find the oil used in various forms including creams, serums, salves, lotions, or balms as well as various lip products. If you’d like to use your own black raspberry seed oil in your daily skin or hair care routine, you could apply it in a number of ways. You might choose to apply a couple of drops directly to your skin, whether it be your face or body, or you could mix a few drops in with your favorite moisturizer. If you’d like to use it on your hair, you could apply a few drops directly onto dry hair and then wrap it in a warm towel to let it sit. You could also mix it in with your favorite shampoo or conditioner while you shower. If you plan on storing your black raspberry seed oil for long-term usage, know that it can be stored for up to one year. Because it is a cold-pressed oil, it will typically do better when stored in a dark, cool place. You might also choose to refrigerate your oil while storing; if you do choose to refrigerate it, you should bring it back to room temperature before using. A good way to warm up your oil is to soak it in a warm-water bath for a couple of minutes. Overall, black raspberry seed oil is an oil that is often forgotten or easily missed due to how popular raspberries are as a food source. It is easy to forget that the seeds of the fruit are also very powerful when used to create an oil. If you have dry, damaged, or acne-prone skin, black raspberry seed oil could help bring balance and health back to your face. The oil could also be beneficial for use on damaged or dry hair as well. Just make sure to be careful and always speak with your doctor or test the oil on a small area of your skin before adding it fully to your skincare routine as your skin may not react as others’ do.